Leg 1 (3.93 miles-1000 foot elevation drop-easy): Not blow out my quads on the downhill. Shoot for 6:30 pace. Leg 2 (7.25 miles-rolling hills-hard): Run a controlled pace (7:00ish), pass some people and have something in the tank for the final leg. 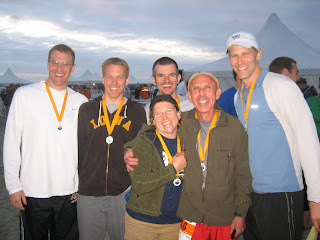 Pre-Race: Van 1 (Sarah, Dave, Matt, Joe, Karl and myself) met up at OHSU and headed up the mountain. The ice got broken when Sarah picked up a speeding ticket, with the special bonus of the officer telling her that "just because she sped doesn't make her a bad person". Once at the mountain, we checked in and soaked in the atmosphere. 20 teams leaving every 15 minutes made for a hectic yet fun starting line. Teams ranged everywhere from serious teams like the Hot Tamales (a top women's team) to costumed teams like The Superheroes and a team from Mexico decked out in wrestling masks. We'd see the first two teams over most of the course. Also of note was the man with scrub bottoms and no shirt who was nice enough to draw an anatomically correct heart on our van. Leg 2 (49:58; 24 road kills @ 6:53 pace): Upon completion of the sixth leg, our van went through the back roads and crashed for two hours at our house as we were about 4 miles from where we'd be taking back over the race from van 2. We would have gotten there earlier but we made the mistake of letting Karl warm down after his leg; about 30 minutes later the search party finally found him in a packed to the gills Fred Meyer parking lot. It was nice to be able to sleep in my own bed though the wake up call came way too quickly. Back on went the clothes (with new underwear and socks) and out the door we went into the heart of the night. My next leg was going to be a challenge. Over 7 miles of rolling hills in the middle of the night. 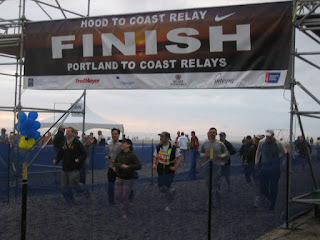 As I waited for the hand off, I realized that there was an ever increasing gap between the previous runner and myself. My competitive side took over as I wanted to bridge the gap immediately. As I took the hand off I had to force myself to keep in control and just slowly catch people. And catch them I did; 14 people in the first 4 miles. This made the darkness a little more doable as you always had a bobbing light ahead of you to chase down. After the 14th person, there was then a gap of 2 miles where no one was to be found and I kept myself occupied by admiring the stars in the clear night sky. The last mile or so was where I really had fun; passing 10 people and pushing it JUST a little bit to a) come in under 7 minute pace and b) pass an additional 10 people. Of course, the next leg was a short one so my warm down consisted of running back to the van and racing off to the next hand off. Overall though the legs felt pretty good. Leg 3 (39:35; 34 road kills @ 6:37 pace): In between legs, we tried to get some more sleep though this time I was much less successful. Somehow a giant horse field didn't feel quite as nice as my own bed. Go figure. In its stead was about half a can of Coke and handfuls of our newly found 55oz bag of Peanut M&M's. That's the best thing about a race like this; you can eat whatever you want knowing full well you're going to burn it off at some point. 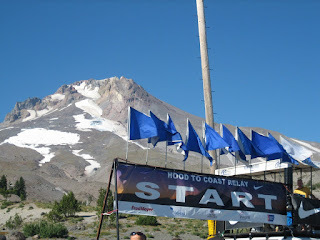 Overall though my intake was pretty basic and race related; lots of fluids (to the point that it seemed every time I took in water or gatorade I was immediately going to the Honey Bucket), peanut butter bagels and Clif Bars. After various levels of sleep and in my case narrowly avoiding getting sucked up by the Honey Bucket cleaners, we were on the course for our final legs. My final leg was rolling hills approaching the coast range (our superstar Joe actually had to climb the coast range in his final leg). As I waited for the hand off, my competitive side was getting stoked as I saw numerous people take off in various levels of discomfort ahead of me. I felt pretty good considering I'd run over 11 miles to this point. So I looked at Sarah and told her and some of my team members to be ready for me at 40 minutes. I got a few skeptical looks and I prefaced it by saying that I might not make it on time, but I wanted to give myself a challenge. The leg itself was trickier than advertised; a lot of dusty roads as they were doing construction in this stretch of the course. It's amazing how you can trick a body to run faster than it wants, simply by challenging it to catch the "next person" ad nauseum. That's exactly what I did, dodging pot holes all along the way and racking up 34 road kills. I approached a stretch where there was a tent and what looked like an exchange point. Knowing I was somewhere in my last mile I started sprinting thinking it was the finish line. As I got closer though I realized I was wrong; it was just a few locals with a really nice setup watching the runners. Right as I was ready to shift gears and slow down, I could HEAR the finish line. Not knowing how much longer it was, I said "screw it" and shifted into overdrive. Waiting for me at the finish line? My lovely wife, who'd worked a double shift as a volunteer and by pure luck came up to our exchange right as our van pulled in. A very welcome prize for finishing the final leg in 39:35. One thing to note though was the amount of support one receives on the course. Being a runner whose team didn't stop along the way to cheer (which was fine; we were hard pressed a number of times to just get to the hand off in time) it was nice to have random folks cheering you on as you plugged along. This came in handy on the final leg as people were cheering you on, giving you an idea as to how much further you had to go, etc. There is a definite sense of togetherness that goes with doing an event of this magnitude. 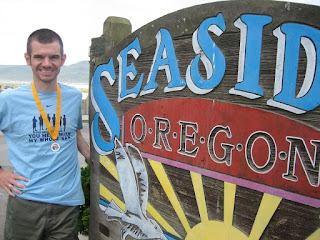 Post-Race: Once our final runner finished (Karl actually was able to pass the van, hand off and walk back to us still stuck in traffic trying to get to the exchange point), we headed off to Seaside. We knew it would be another 4-5 hours until our team came in so we, being the smart Van 1 folks we were, limped out of the van and partook in the beer and hamburgers being sold at the finish line. It was great after such a hard effort to be able to sit back, trade war stories and just generally laugh about what we'd accomplished. What had started out as 6 individuals had combined into a tight knit team of runners proud of the work they'd put in. Given the competitive nature of the group and the fact that everyone in it had done races at some point, there was a realization that we fed off each other to produce faster times than expected. Good thing too; Van 2 while also having a fun time had a much more laissez faire approach. A quick guesstimate had our van average 7 min miles while the other van averaging 9. Needless to say both group were happy to be where they were. In fact, when we took a final picture of Van 1, my prompt of "Carried them on 3" got the biggest laughs of the weekend. So about 7:30pm, 90 minutes under the cutoff, our final leg came in. We all congregated and crossed the line as a team. 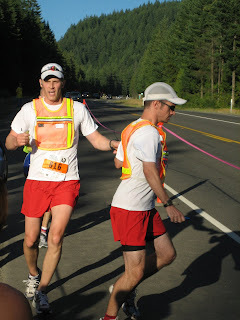 At 26 hours, 19 minutes (8:01/mile pace), we finished in the top 25% of teams and were about 45 minutes over what we'd been projected at which was pretty good since that time was considering only 11 of our runners. We took a few team pictures and then just like that, it was over. Most everyone drove back to Portland that night and were itching to get on the road. Becca and I elected to stay in town, enjoy the experience and head back the next day. Thankfully that involved lots of pit stops as my increasingly sore legs appreciated the wandering through the streets of Seaside and Astoria.